Learn how to identify and treat this destructive lawn disease. While we love spring and enjoy being outdoors this time of year, cool temperatures and extra rainfall create the perfect conditions for fungal diseases in your lawn. Healthy vigorous lawns always have a better chance of standing up to pests and diseases; even lawns that are well cared for can succumb to disease when conditions are right. Take-All Root Rot (TARR) is an aggressive fungal disease that is infecting lawns all across North Texas. What is Take All Root Rot? If you have St. Augustine, Bermudagrass, Zoysiagrass or Centipedegrass in your landscape, your lawn could be susceptible to Take-All Root Rot. Cool-season grasses such as Fescue and Rye are also susceptible. TARR is caused by a fungus caused by Gaeumannomyces graminis var. graminis. 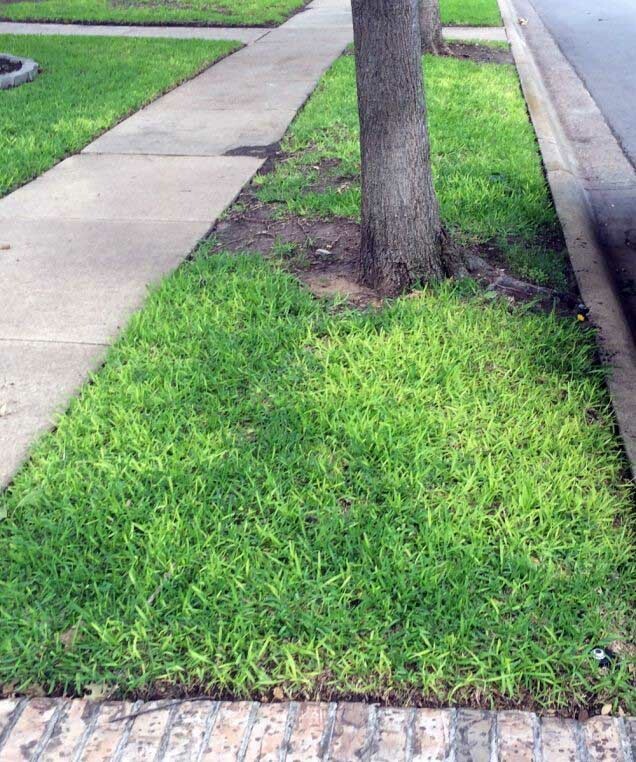 If TARR is left unchecked, it can quickly kill off large parts of your lawn, or even your entire lawn. Grass blades in this TARR infected lawn are beginning to yellow. What does Take-All Root Rot Look Like? When your lawn is suffering from TARR, it will be slow to emerge in the spring. Young leaf blades often turn chlorotic (yellow or very pale green). These symptoms are often mistaken for general chlorosis (a nutrient deficiency) or chinch bug damage. The main difference to note is that TARR will yellow your lawn in much less-uniform patches. The leaf blades will yellow first then fade to brown as large patches up to several feet across die off in an irregular pattern (as opposed to defined or circular patches). The leaf blades do not pull away from the stolon, like they will with Brown Patch.The roots will also be dark brown as they begin to rot away. If you notice these symptoms, please call a professional lawn care maintenance team to properly diagnose and offer a treatment plan. TARR is very difficult to treat. 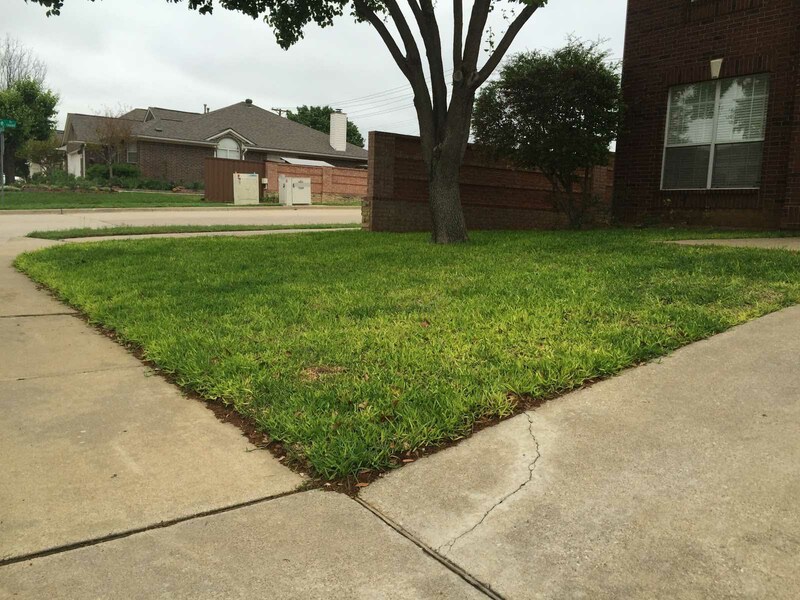 Simply removing the lawn and re-sodding with the same grass won’t solve the problem; your new sod will simply become re-infected. While there are some chemical fungicides that can be applied to a TARR infected lawn, they often are not very effective at controlling the fungus. Treatment will require patience and diligence. The first step in dealing with TARR is to make sure you’re applying good maintenance practices in your lawn and landscape. Healthy microbial growth in the soil is paramount to preventing and managing this disease. Aerating soil through the year reduces compaction and increases airflow to the roots. It also helps break down thatch by stimulating microbial activity. Lawnmowers and other maintenance equipment spread the disease from lawn to lawn. Talk to your maintenance team, if you use one, to be sure they are cleaning their blades between homes. Our organic Soil Building program keeps soil healthier and more bio-active to grow stronger lawns that are more resistant to pests and disease. Don’t overwater your lawn. Make sure you are watering your lawn properly, especially very wet and very dry times. Reduce thatch build up in your lawn. Aeration, proper mowing and watering will help reduce thatch. Don’t over apply high-Nitrogen fertilizers. Too much Nitrogen contributes to thatch buildup in the lawn. Acidify the soil by applying peat moss to the entire lawn. Texas A&M research has shown this treatment to be effective. Peat moss has a very low pH. TARR thrives in alkaline soil; lowering the soil pH so it’s more acidic can help suppress the fungus. Spray the lawn aerobically-brewed compost tea extract. This will stimulate microbial activity in the soil. We do this through our Soil Building Program. Have more questions about your lawn this spring? Send us a message through our site or contact us on Facebook and Twitter.